As an artist and printmaker my introduction to the world of collecting old prints was integrally linked to the study of the work of particular artists who I admired. I came to realise that as well as having the opportunity to observe artists’ work in books or first hand in museums, I could purchase original prints to study and enjoy at home. 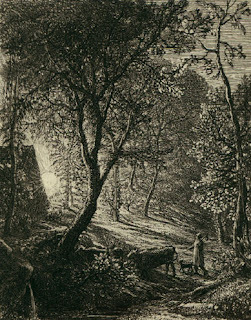 The first work I purchased in 1988 was the small Samuel Palmer etching, The Herdsman’s Cottage. I had heard of Palmer through another colleague (Robert Preston) who had studied at Camberwell School of Arts and Craft in London and had seen his work in an exhibition in the 60s. Although small, the Herdsman’s Cottage introduced me to the possibilities of using solely line in my etchings. It showed me a way to build up a rich tonal range through the overlaying of different layers of line hatching. It also demonstrated how much detail could be contained in such a modest sized etching. The print also exuded a particular emotive quality which I began to emulate in several of the etchings I made during this time. Some people describe Palmer’s etchings as being part of a romantic pastoral genre. To me they are images which speak of an idyllic and ancient past. They look back at the past with nostalgia and longing and a sense of wonder. 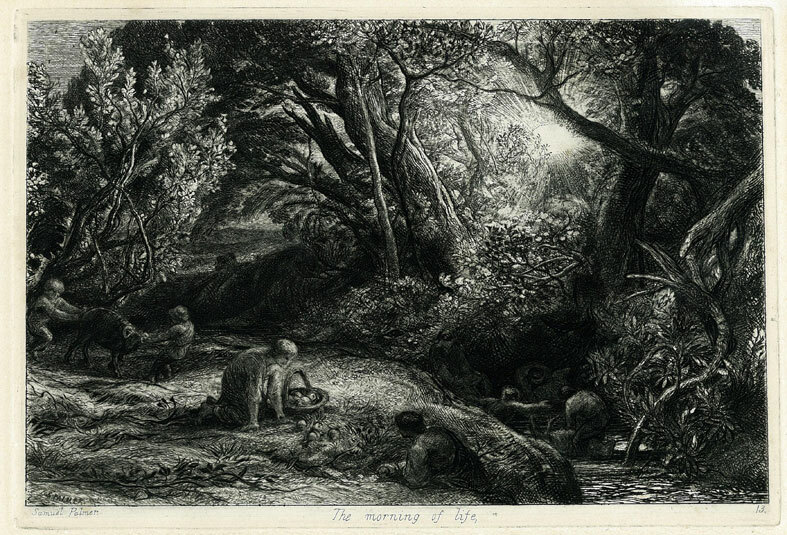 I began to find more works made by Palmer and the group of artists known as "The Ancients" with whom he worked during his formative years at the small village of Shoreham (1826-35). Over the years this investigation has broadened. I continue to be challenged by the work of printmakers whose works are both instructive and stimulating.